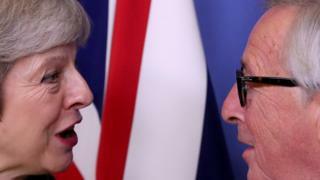 Just hours ahead of UK Prime Minister Theresa May's touch-down here in Brussels, there is evidence - once again - of a yawning gulf between what's being hinted at by her office and the EU's reality. Downing Street expects a revised Brexit deal in the offing, possibly ready for the House of Commons to vote on early next week. EU chief Brexit negotiator, Michel Barnier, is still talking about a "worrying political impasse". Jean Claude Juncker, the president of the European Commission, says he expects no breakthrough during his meeting with Mrs May - but that is polite language compared to what I'm hearing behind the scenes. Of course, it depends exactly what she asks for. If the prime minister is looking for legally-binding assurances that the backstop mechanism to guarantee the Irish border will remain open after Brexit is not a trap or a permanent EU-UK post-Brexit solution, then EU diplomats tell me they could draw that up "anytime, 24/7". That is, if Mrs May thinks it would be enough to get the Brexit deal through Parliament. But few, if any, believe that would suffice for all MPs in the European Research Group, plus the DUP, to vote "yes" to the deal next week - never mind all the uncertainty in Parliament now caused by resignations from Labour and Theresa May's Conservative party. And if the prime minister still wants backstop "assurances" to include a unilateral exit mechanism for the UK or a fixed, immovable end date, then she will meet an EU wall. This is because the backstop is also a fallback mechanism for the EU to protect its single market. The idea in Westminster that the EU will "blink in the end" rather than face a no-deal Brexit is correct, in that the EU is more flexible than it has previously indicated. But the extent of its flexibility is grossly over-estimated by many MPs. True, the EU has past form in budging at the last minute in high-stake negotiations like the Greek debt crisis - but only when it was deemed to be in the bloc's greater interest. In the case of Greece, the EU decided to bend the rules to save, in the opinion of its leaders, the wider euro currency. But watering down or abandoning the backstop mechanism altogether is thought to be damaging to the EU. However much EU leaders want to avoid a no-deal Brexit, leaving exposed a 500km (310-mile) gap is thought to be far more costly for them in the long term. That is because of the risk of non-EU regulation goods being smuggled into the wider single market via Northern Ireland and the rest of the UK. 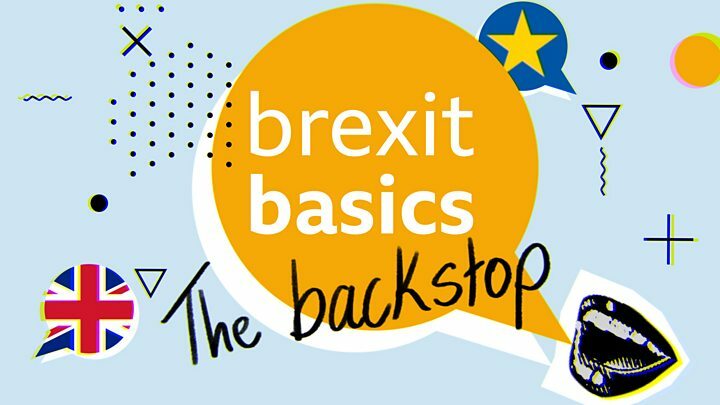 That perceived threat to the single market means the EU will not abandon or fundamentally weaken the backstop unless there is a watertight alternative in place. Last week, a group of Dutch politicians came back from the UK lamenting what they described as the "lack of knowledge" and "lack of interest" amongst many in Westminster about how the EU works. The lack-of-knowledge part is also being said in Brussels of the UK's Attorney General Geoffrey Cox, on whom so much Downing Street hope is now riding in order to try to get a deal though Parliament. While the House of Commons has swirled in increasing turmoil over the last few weeks, little at all has changed in EU-UK talks. The current impasse over the Brexit deal still comes down to the UK disliking the backstop mechanism. EU countries dislike it too, by the way, and would rather never use it - but the EU is "only" offering legally-binding clarifications or assurances to express this - as well as ways to avoid triggering the backstop altogether. One example of the latter would be the UK agreeing to a permanent customs union. But Downing Street insists those ideas won't fly in the House of Commons. EU officials believe any breakthrough, if found, will materialise next month. If not, the EU is getting ready to grant an extension to the UK's leaving process - Brexit is due to happen on 29 March. They realise, too, that MPs may call for that extension even earlier. But the tone is noticeably hardening in Brussels. EU officials say if no progress is made with the UK, regardless of any extension time, then they will use those extra months to deepen their planning to protect themselves from a no-deal Brexit. Of course, to an extent, this is fighting talk, designed to increase the pressure on the UK. So are the repeated declarations of EU unity over Brexit by Michel Barnier, the EU's chief Brexit negotiator, as he tours European capitals. That said, I have been struck of late by a growing sense in the EU as time goes by that a no-deal Brexit – though highly undesirable – will be manageable for them, while still very damaging to UK.